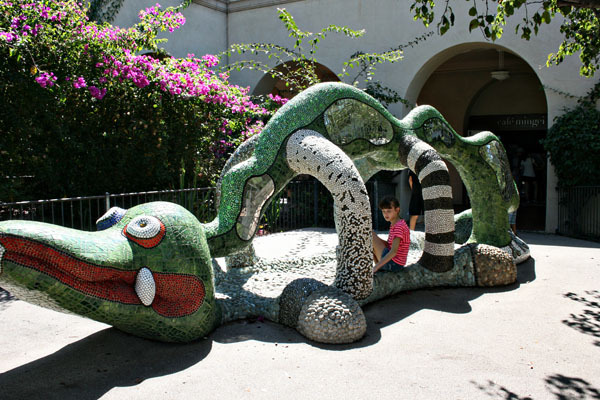 Balboa Park is one of the best places for families to visit in San Diego, California. There are a variety of gardens, museums, cultural spots, theaters, playgrounds and walking trails in this 1200 acre park. And in pricey Southern California, it’s wonderful to find a single location with tons of activities that are completely free in San Diego! 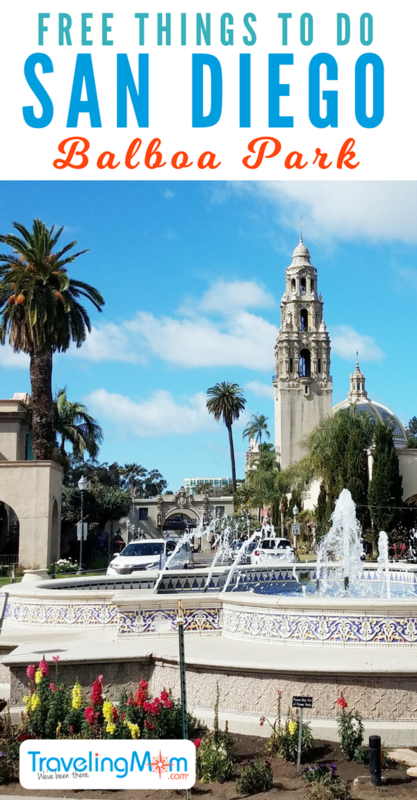 Balboa Park is a great place to spend the day (or a few days, if you have time) when visiting San Diego. 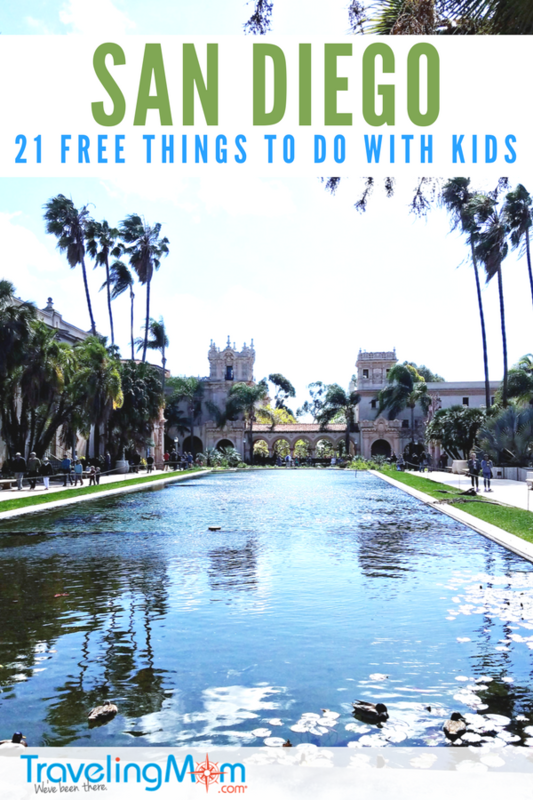 Keep reading for our native San Diegan Day Trips TravelingMom tips for family fun for free in Balboa Park. 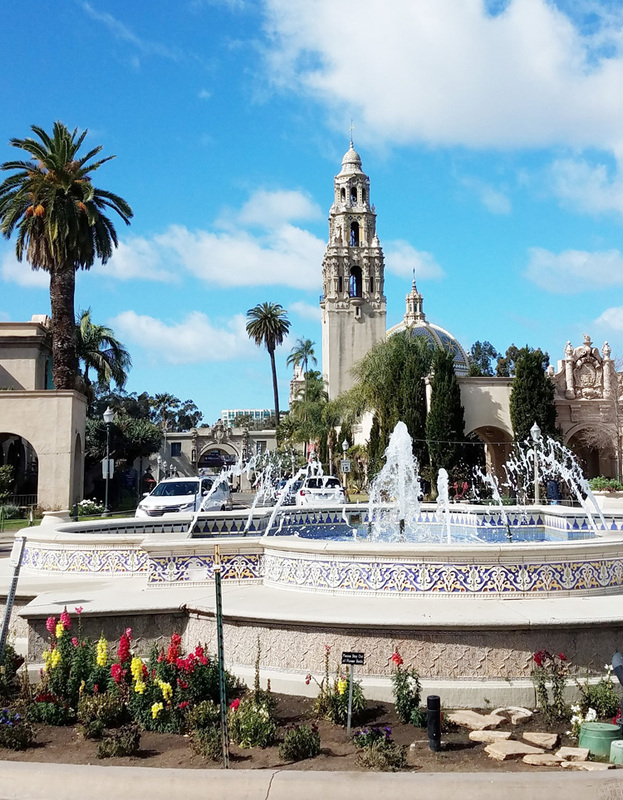 If you’re looking for free things to do in San Diego, Balboa Park has enough activities to keep you and your family busy for several days. Check out the museum website and the links throughout this article for planning tips. My advice is to arrive early, pack lunch and a few snacks and wear practical walking shoes because this Park is expansive. Sundays are particularly crowded because of free special events that take place each week on this day. And don’t forget your camera, because Balboa Park and its 100-year old buildings and gardens are perfect for family photos. Where Can I Park for Free in Balboa Park? In the middle of the city, parking can be hard to come by, let alone find a free place to park your car for the entire day. There are parking lots all throughout Balboa Park where you can park your car in close proximity to the attraction you wish to visit. When visiting on the weekends or busy times of the year (summer, in particular), be sure to arrive early to find the best spot. 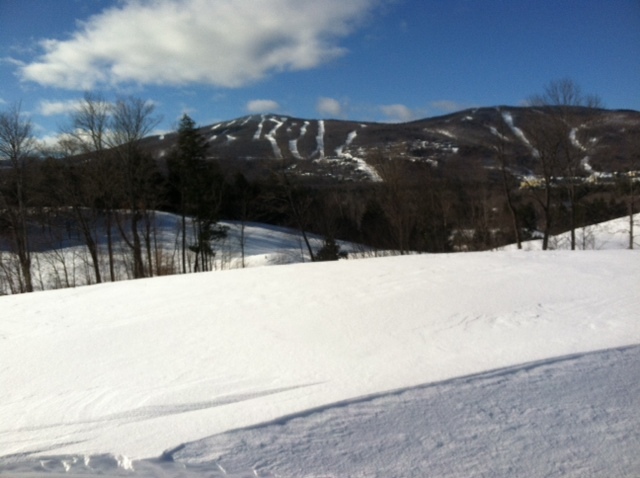 On crowded days or on special event days, there is often overflow parking available off-site with free bus drop off. Signs are posted on the sidewalks during these events. Balboa Park is completely free to roam and explore. All of the gardens, playgrounds and walking trails are open to visitors every day and select attractions are also free. On each Tuesday of the month, museums and attractions rotate to offer free admission to San Diego residents. There is a rotating calendar online. This offer includes the Museum of Man, Reuben H. Fleet Science Center, Japanese Friendship Garden and Model Railroad Museum. Not a San Diego resident? 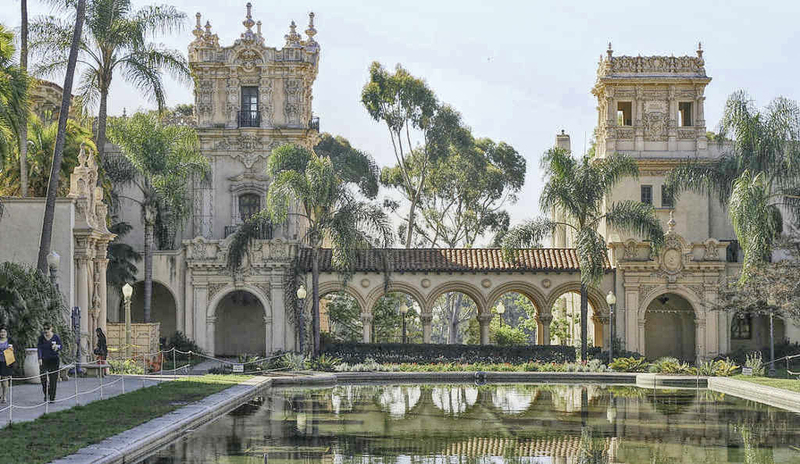 You can still receive admission for free in Balboa Park activities. Some of the museums also offer free admission to active duty military and their family or local college students (with ID). The Veterans Museum and Memorial offers free admission every day for active duty military. 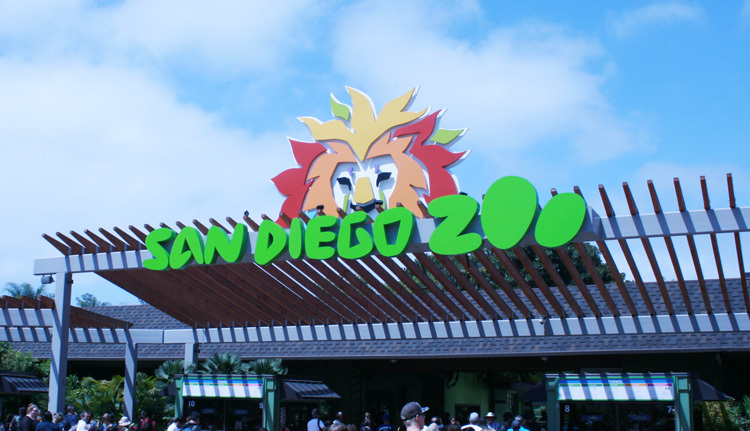 Each October during the Kids Free In San Diego event, the world-famous San Diego Zoo, Reuben H. Fleet and other Park museums offer free admission to children as well. Where Can You Cool Down in Balboa Park? 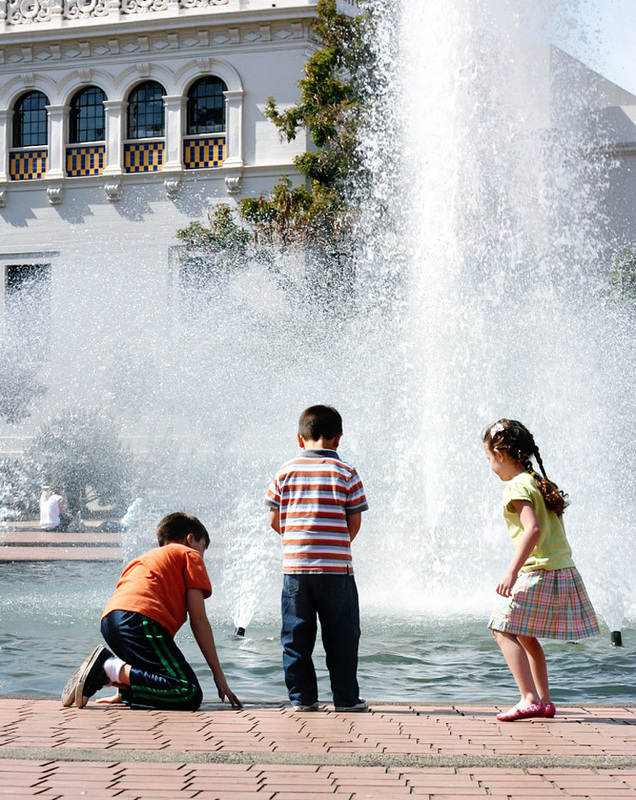 What kid doesn’t love a huge fountain? Mine have always loved sitting next to the fountains in Balboa Park, letting the cool mist spray them. In front of the Reuben H. Fleet museum you’ll see the Bea Evenson Fountain. The Plaza de Panama Fountains are located in front of the Museum of Art. Though you will often find guests splashing in the fountains on a hot day, this is prohibited so resist the urge to wade. Other than the mist from the fountains to cool down, I suggest a relaxing walk inside the cool Botanical garden building. And of course, the indoor museums are air-conditioned. What Cultural Things Are There to Do in Balboa Park? Each Sunday afternoon, the House of Pacific Relations International Cottages representing 33 countries are open to the public. There are cultural decorations inside each house and food samples offered to guests. One of the houses also hosts a program on the lawn each week featuring music, dance, costumes, crafts and art representing their country. An annual Ethnic Food Fair gathers the countries for a joint cultural event including performances and food (event is free, food cost is extra). 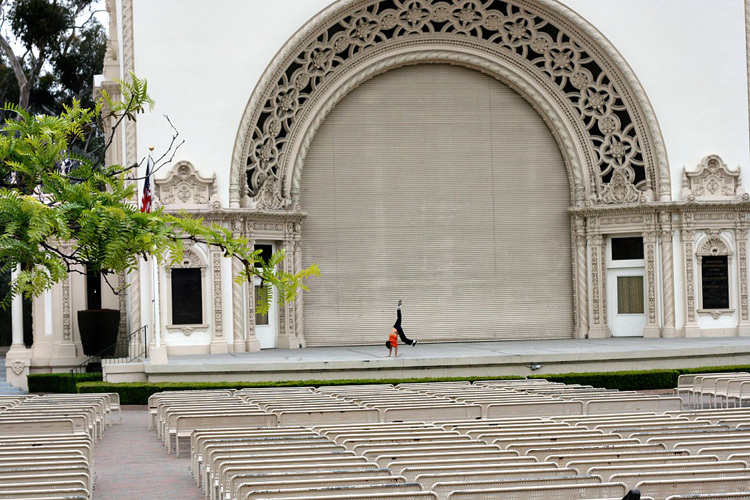 Each Sunday afternoon, the Spreckels Organ rings out beautiful music in a free outdoor concert. This is an informal affair that welcomes children and pets. No tickets needed, just grab a seat on one of the many benches, pull out a snack and enjoy the sounds. Bring an umbrella during sunny months because there is no shade in this area. When I was a kid, my parents would bring me here with my roller skates and I’d skate around the perimeter of the pavilion while listening to the music! Make a stop by the Balboa Park Visitor’s Center and find out what free tours are being offered on the day of your visit. There are botanical tours of the gardens, architectural tours that highlight the 100-year old buildings and Park ranger-led tours, as well. What Kind of Special Events Are Held in Balboa Park? 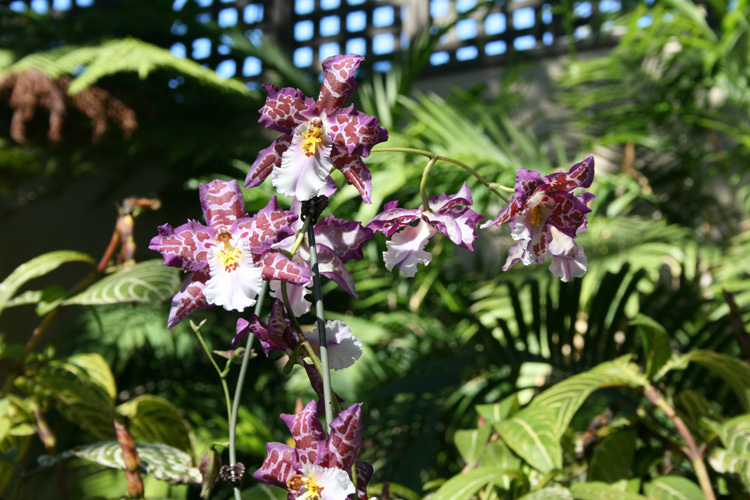 Special events are offered year-round in Balboa Park. December Nights has brought thousands to the Park for nearly 40 years to celebrate the “most wonderful time of the year”. Museums open their doors and offer free admission, there are top-notch music and dance presentations on various stages and crafts and games for children. Naturally this is an extremely popular event so plan to arrive early. Read more about holiday activities in San Diego. The annual EarthFair in Balboa Park is the largest free annual environmental fair in the world, drawing around 60,000 visitors. Keeping with the environmental theme, it’s recommended to use public transportation. The House of Pacific Relations International Cottages also offer events year-round dependent upon the country and their cultural holidays. The dance clubs of the International Dance Association host a free festival each year with free lessons. Can You Bring Your Pet to Balboa Park? There are three dog parks in Balboa Park so dogs can get off leash and run or play. On a leash, you can bring your dogs with you on the hiking trails, through the heart of the Park or even to the Spreckels Organ Pavilion during the Sunday concerts. The Cabrillo historical bridge spans the Cabrillo Freeway (scenic state route 163). This 1500-foot long bridge allows foot traffic and offers a beautiful view of the downtown city and Park. There are various sculptural “gardens” throughout Balboa Park. Some of the art sculptures encourage climbing and touching. Learn more about fossils, gems and minerals at the San Diego Mineral & Gem Society. Discover Chicano, Latino and Mexican culture, including Ballet Folklorico at the Centro Cultural de la Raza. Admission to the photographic gallery at the Museum of Photographic Arts is “pay what you wish” on certain days during the year. Family photos are made easy when there are so many amazingly diverse gardens in this park. Hardly a visit to Balboa Park goes by when you don’t see a bride taking pre-wedding photos in the Park or a model shooting for a magazine. Some gardens are larger than others, but each offer something unique. We visit the Botanical Building during each visit (note that it’s closed on Thursdays and holidays). This large lathe building was built for the 1915 Exposition. It is graced with a peaceful lily pond out front. This building is a perfect respite on a hot day. Free docent-led tours are offered on the third Friday of each month at 11 a.m. I love the Alcazar Garden for its gorgeous Moorish tiles, boxwood hedges and fountains. Kids will enjoy the Children’s Peace Garden outside the WorldBeat Cultural Center with educational gardening classes on Sunday afternoons. The Zoro Garden is a perfect place to spot butterflies. Stop by this quirky artist’s community and you might find yourself with a paint brush in hand! Just follow the brightly painted tiles into the courtyard and watch as local artists create beautiful and unique works. On our last visit, the kids participated in a free drawing lesson. 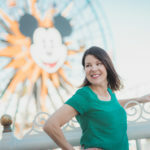 Are There Playgrounds in Balboa Park? 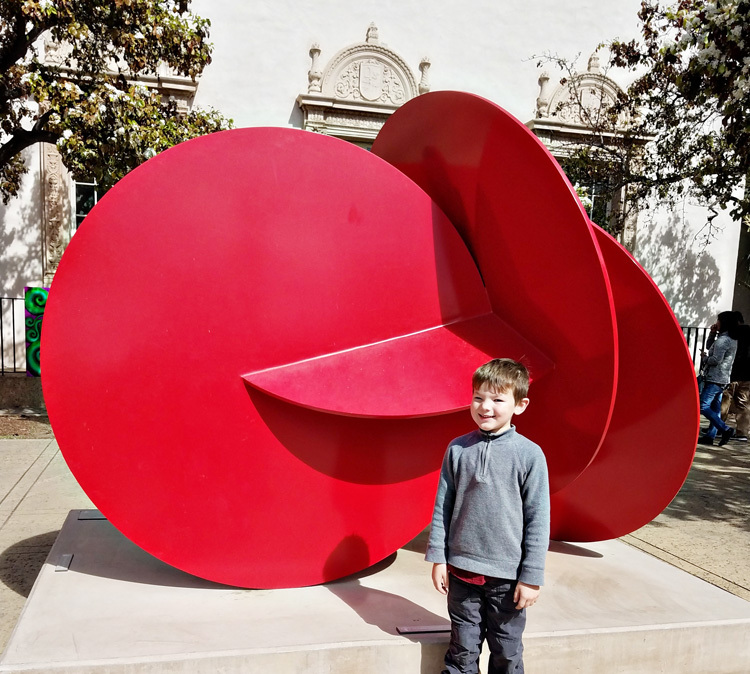 There are several different play structures in Balboa Park, geared for different ages and perfect for kids to burn off steam in between museum visits. We often let our kids play on the Sixth Avenue Playground before taking a long walk on the trails. 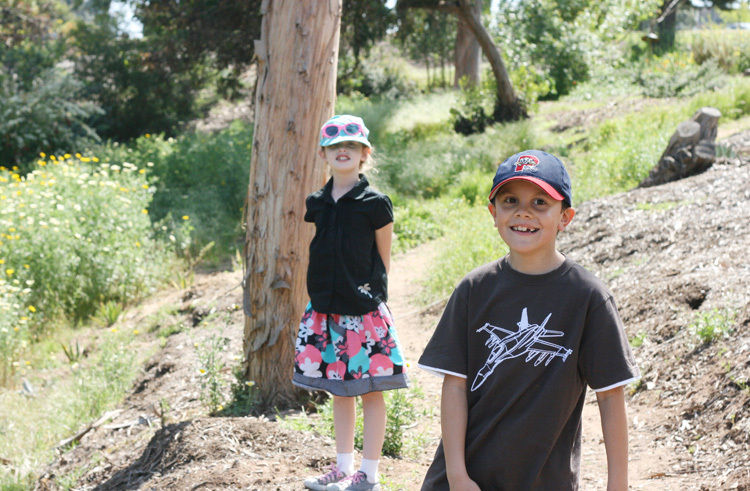 Click the link if you’re looking for more things to do outdoors with kids in San Diego. Enjoy couples dancing, mixers and line dances during the weekly International Ethnic Folk Dancing. Come to dance or just watch the fun on Sunday afternoons in the Balboa Park Club Building. Celebrating diverse cultures, the WorldBeat Cultural Center offers special events like concerts and drum circles. They also offer an Alternative Health Event is offered bi-monthly with free acupuncture, massage, chiropractic and yoga. 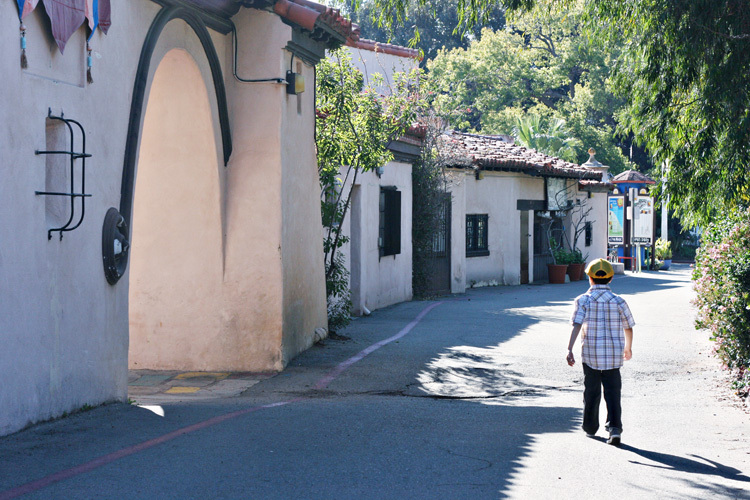 Where Can You Hike and Walk in Balboa Park? 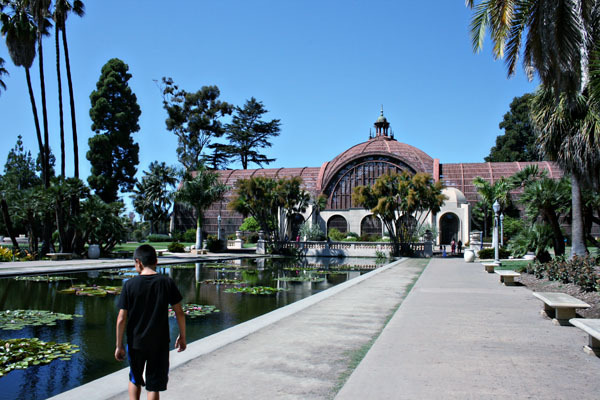 Balboa Park has 65 miles of trails that are perfect for walking, jogging, hiking or biking. The Florida Canyon Native Plant Preserve covers 150 acres, with various hiking trails. For an easier walk, try the California Native Plant Garden which is five acres with a quarter of a mile long footpath. The 2-acre Palm Canyon packs 450 palms along the shady trail. Find out more (including PDF maps) via this link. Can You Have a Picnic in Balboa Park? There are many restaurants and dining spots (from hot dog carts to high-end dining). But if you’re aiming for low cost, bring your own lunch. There are large grassy areas and shady locations under the trees to lay down a blanket, eat a picnic lunch and even take a nap, if you wish! 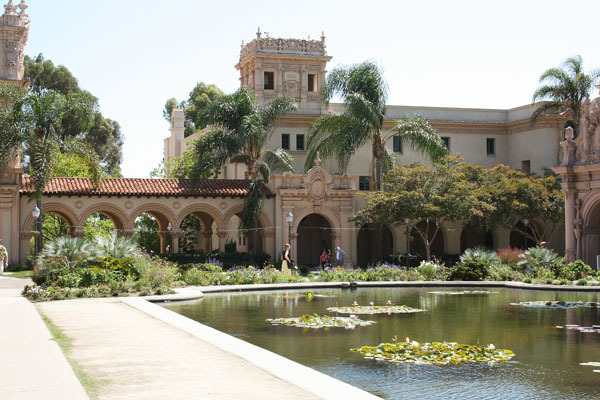 Noted as one of the best small museums in the world, the Timkin Museum of Art also the only free art museum in Balboa Park. See fine paintings from Rembrandt and van Dyck, as well as Russian icons and French tapestries. No need to bring a watch! Each quarter hour, melodious chimes ring out from the California Tower that can be hear all throughout the Park. Tickets can be purchased to climb the tower and witness the amazing views of San Diego. Listening for the bells to ring (and counting out the time) is one of my kids favorite parts of visiting the Park! Take in the heavenly scent of 1600+ roses that bloom in the 3-acre Inez Grant Parker Memorial Rose Garden. It’s a gorgeous photo stop, especially when the rose blooms peak in April and May. If you’ll be in San Diego for a few days, be sure to check out the other free things you can do in the area! 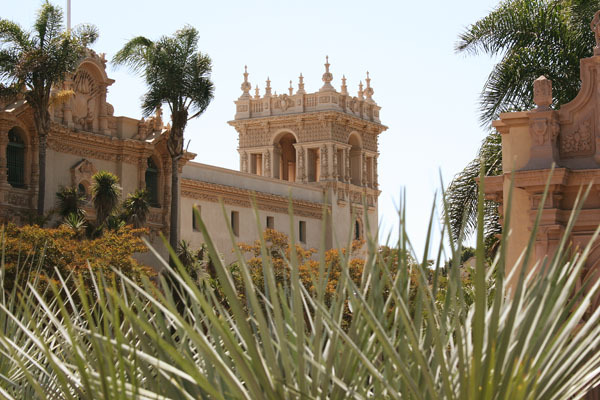 What would you most like to explore on a visit to Balboa Park? Share with us in the comments! Is the Pride Parade reallt to raunchy for young teens? Natives tell me this, eventhough they go to show support, they advise against taking my 14 year old, Transgender grandchild. Certainly what is appropriate for some families, isn’t for others. I have friends that take their very young children, while have not yet taken my children. You’ll need to consider the maturity level of your grandchild and decide from there.